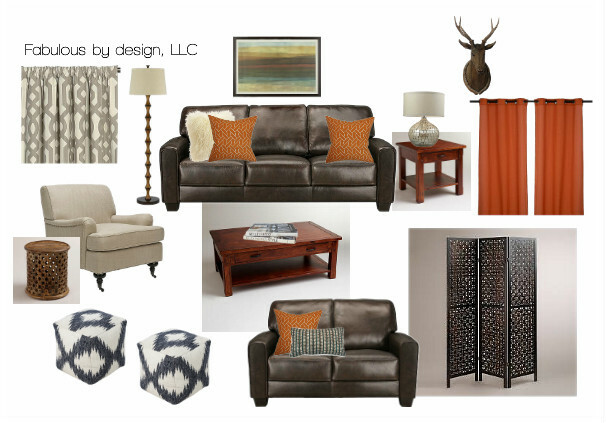 Hey guys, today I thought I'd share my latest Design Board and the style is Rustic Chic! I have a client who needed to give their open concept family room/office a whole new look. These two spaces flow right into one another with no divide, and their existing brown leather sofas needed to stay. So the first thing I did was use a divider screen to separate the two spaces and define their function. Next the orange in the artwork inspired me to use orange pillows and orange curtain panels in the office to visually tie the two spaces together. A cream mongolian fur pillow and patterned curtain panels add pattern and texture to the space. And finally the poufs, tribal end table and deer stag head add a rustic element to this space for an overall eclectic look! Ahhh, so many super affordable finds here and a few higher end ones too! FYI, World Market is having a huge sale right now so check that out because it's ending soon. We also switched out this $398 lamp above for an almost identical one from Home Goods for $49...total SCORE! Even affordable pillows from Pier One were used instead of the ones sourced above. I love the entire look - great pop of color with the spice curtain panels and such fun poufs!! Thanks! I am in love with those Poufs!! You nailed rustic chic with this one Jane! Jane, the pops of orange look so great with the brown leather. Love how you pulled it all together!